This candle burns in memory of Gracie the Boston Terrier who went to the rainbow bridge on December 12, 2000 at 1:15 am. She was only 2 years old and in her short life touched so many hearts. This website will be dedicated to her memory. Please click on the candle to go to her website. 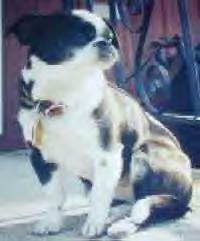 Mindi disappeared from her porch in Penndel, PA on the evening of June 30th. Very small, 10 lbs., arthritic, Black n White. Her little legs are only about 3" long! Very short shiny straight hair, and long tail. Was wearing red collar with all tags. Cute tiny little thing; always mistaken for a puppy. Extremely friendly. Owner and traveling companion is heartbroken, as are other family members including small grandchildren. We are all shes ever known. Cannot survive outside on her own. Total housedog devoted to HER REAL FAMILY. REWARD WILL BE PAID WITH NO QUESTIONS ASKED. Please help us find her. She deserves to spend her last years with her family! She is wondering where we are and must think we have desserted her. Many tears have been shed! HELP US PLEASE.